There are endless opportunities when it comes to pretzel pizzas. Go savory, sweet or spicy! Recipe variations are listed below. Also, try these suckers on your barbecue grill! Remove pretzel flatbread from freezer. Turn golden brown side up and begin topping. Lightly spread marinara, then cheese, tomatoes and fresh basil. Sprinkle with pretzel salt (as much or as little as you prefer). Bake in the oven for about 15 minutes or until heated through and cheese is melted. I like to bake mine on the racks for a crispier crust. Place a piece of foil or baking sheet underneath to collect drippings. PIEROGI: flatbread, mashed potatoes, smoked Gouda, caramelized onions, pretzel salt and green onions for color. MOZZARELLA, MARINARA & ROASTED RED PEPPERS: flatbread, marinara, lightly sprinkle dry basil and oregano, chopped roasted red peppers, mozzarella cheese, and pretzel salt. JALAPENO, GARLIC & CHEDDAR: smear roasted garlic on flatbread, add sliced jalapenos, cheddar cheese and pretzel salt. ROASTED RED ONIONS, GARLIC & SMOKED GOUDA: flatbread, smear roasted garlic on flatbread, sprinkle with roasted red onions and top with smoked Gouda. Sprinkle with pretzel salt and bake. 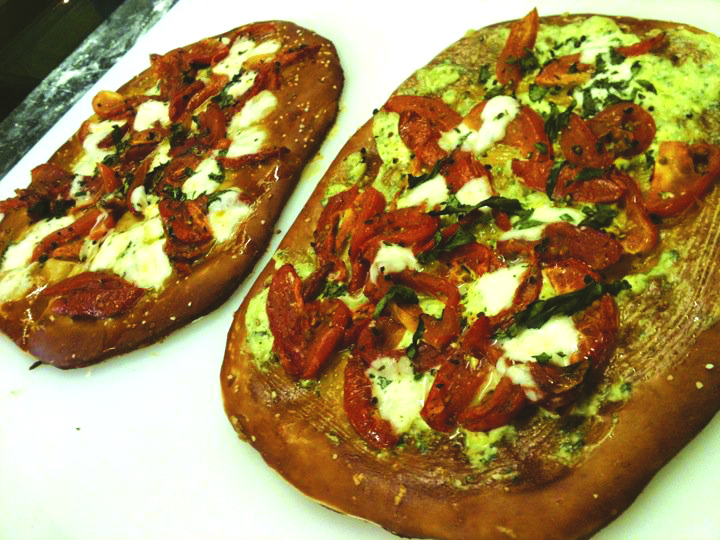 LEMON, PESTO AND TOMATO: flatbread, lemon EVOO (just a drizzle), pesto topping, sprinkle with pretzel salt and bake. When out of oven, top with freshly sliced tomatoes, cut and serve.